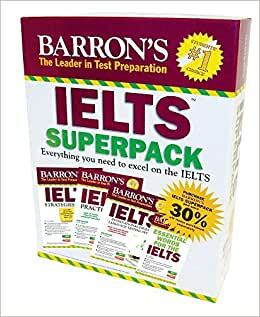 Academics and professionals looking to validate their English language proficiency by taking the IELTS get the most comprehensive preparation available anywhere with Barron’s IELTS Superpack. It consists of the brand-new Barron’s IELTS manual with MP3 CD, IELTS Practice Exams with 2 audio CDs, IELTS Strategies and Tips with MP3 CD, and Barron’s Essential Words for the IELTS with MP3 CD. The books in the Superpack have a combined total value of $86.96. Students who purchase the IELTS Superpack for $59.99 get more than 30% off the price of items purchased separately. 品牌: Barron's Educational Series Inc.,U.S. On the cover they wrote that the books are 3rd edition but inside they had books of 2nd edition. I've received 2nd edition though they mentioned it as a third edition while buying it. This superpack helped me a lot in reviewing ielts. It so eAsy to understand and it has strategies and tips that i can use in order to pass the test. I will recommend this to my friends who are planning to take ielts test too. 1.0 颗星，最多 5 颗星Not the 3rd edition!! !